The March club colourway was inspired by Virginia Apgar, an obstetrical anaesthesiologist who pioneered the testing of a newborn's transition from life inside the womb to life outside after birth. In addition to developing the ubiquitous Apgar Test, she was also the vice president and Director of basic research for the March of Dimes, and a strong advocate for vaccination in the fight against mother-to-child transmission of German Measles (Rubella), which was pandemic in the United States at the time. The name of the colourway comes from the Latin word for birth, breaking out or originating. Given that March is the month in which my eldest daughter was born, this seemed like an apt name! The colours come from obstetrics - greens for the surgical scrubs worn by doctors and nurses in the delivery room, and for the tiles that are everpresent in hospitals, with a bit of mauve and dark blood red for contrast. I've been away for the Easter holidays for the last week or so, and I took along my Cortus and a spindle to get a bit of work done on it. And I was struck, once again, but how much I like spinning Wensleydale. This fibre is certainly the polar opposite of last month's Corriedale: from a very straightforward easy-to-spin medium fibre, we've gone straight into longwool territory this month, and I'm finding it to be a lovely change! The Wensleydale is much more slippery to spin then a lot of other wools that we've used in the club, due to its lack of crimp, but the shine and lustre of the singles are amazing. I think I'm going to keep this one as a singles yarn, both to emphasise the drape of the yarn and to keep the colours from getting too muddied. Which means it's going to have to become some kind of lacey something to keep from biasing...anyone have any suggestions? There is still some space left in the second quarter of the 2016 LGFC, if you'd like to join in the fun. Club membership gets you three monthly shipments of 4 oz/113 g of an exclusive colourway inspired by a female scientist, and also includes a brochure with information about the scientist, the development of the colourway and the fibre base. We'd love to have you join us! This was my first attempt at both spinning from the fold and spinning long draw. 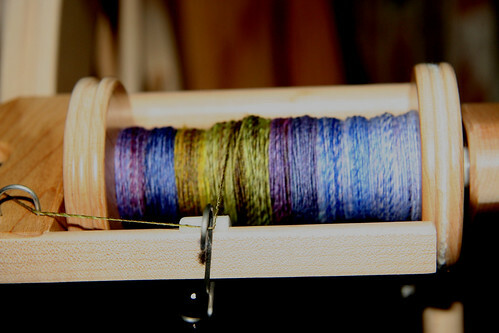 I didn't mean to try two new things at once - spinning from the fold was the goal, but once I started I was having so much fun letting the fibers flow off of my finger that I tried just pulling back with that hand and, lo and behold, I was spinning long draw (or sort of long draw. Maybe more like medium draw). And boy, is that a lot faster then inchworm drafting. I split the top lengthwise in to two equal sections (by weight). One half I tore into 4-5 inch chunks, stuck them in a ziplock bag, and pulled them out randomly to spin the single. 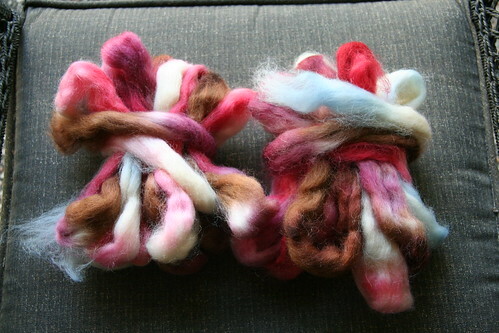 It took me about 1.5 hours to spin the first 2.5 oz (hardly any time at all, for me). 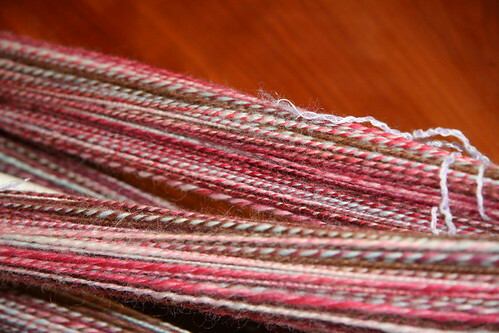 The second half I also spun from the fold, but tore off pieces as I went down the length of the top, maintaining the color sequence as dyed. I've become a big fan of rough finishing my handspun, aka soaking it in really hot water with a bit of agitation, so that any changes that are going to happen, happen before the yarn gets knit up into something. I also tend to overply, so this kind of finishing helps even out the yarn and get it closer to balanced once it's dried and ready to go. The spinning for this was fast and furious. It was all done (spun and plied at least) in three days, assisted immeasurably by the fact that I was home with sick kids for at least two of those days. 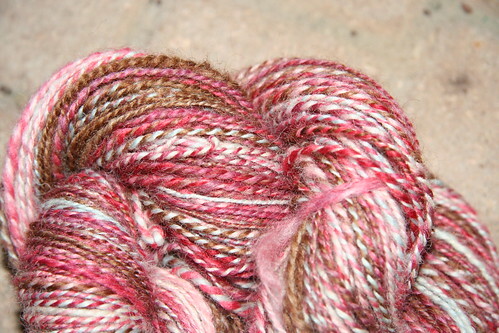 It is pretty fuzzy around the edges, due to my attempts to spin "woolen". 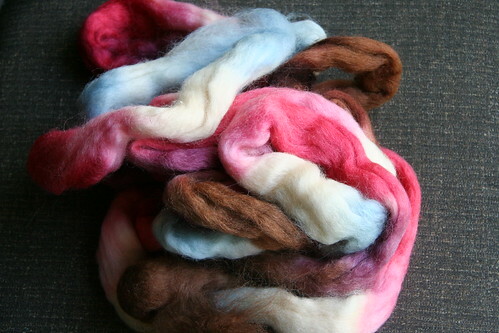 Now that it's done it's very pretty - I love the combination of the colors - but I'm not such a fan of the Romney wool. It just feels coarse to me. Maybe I'm spoiled from the merino I've been working with recently, but this feels too scratchy for me. I'm thinking this one will go in to the stash to marinate for a bit. 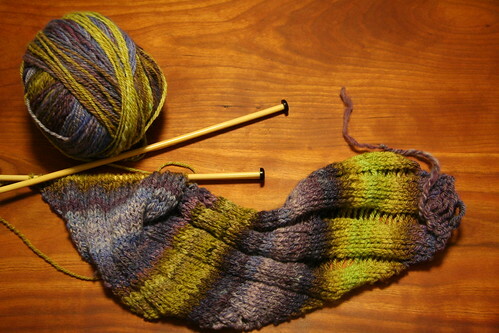 Maybe it will be a wee Christmas present for one of the few friends/relatives I have that knit. 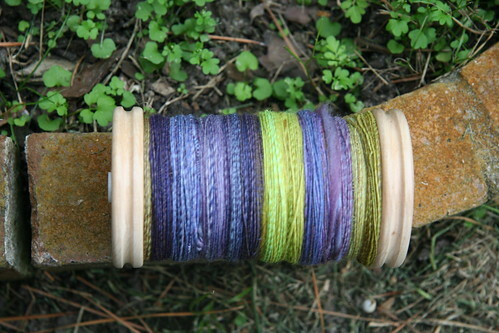 And now I may have to call a moratorium on spinning for a while until I get my list down to something more managable.